Ring: 18ct Gold. This striking ring, in unique Bulgari styling, sets it apart on any finger. 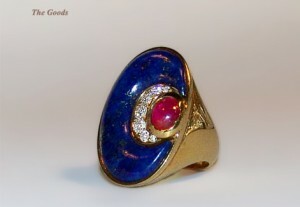 Set with gem quality Lapis, Natural Ruby and Diamond accents, unmistakable Bulgari.